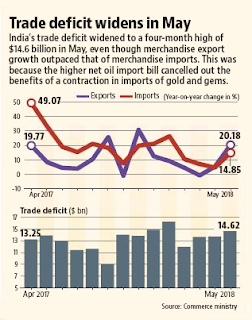 India’s exports grew a robust 20.18% in May, a six-month high, benefiting from a broad-based recovery in sectors led by petroleum. Costlier crude also caused imports to grow 15% in the month, leaving a four month high trade deficit of $14.62 billion, or about ₹98,732.03 crore. Trade deficit was $13.84 billion in May 2017. The rise in imports in the month was driven by 49.46% jump in oil imports at $11.5 billion on the back of surging international crude prices. Global Brent prices ($/bbl) increased 50.68% year on year in May 2018 as per World Bank commodity price data.